Tired: user reviews; wired: influencers? The Epic Games Store seems to think so. In a little more than a month since launching its marketplace, Epic Games itself has emphasized the differences between its marketplace and Steam with things like free and exclusive games, even as it adopts features common to its rival, like a return policy. But until a week ago, Epic hadn’t said much about the biggest difference, which also says a lot about who Epic considers its biggest customers. It has some — developers and consumers more accustomed to the Steam experience — wondering how they will fit into this vision, too. In a Russian-language podcast that originally aired in early December, after the Epic Games Store launched, Sergey Galyonkin, Epic’s director of publishing strategy (and the creator of the Steam Spy game ownership tracker), discussed the Support-A-Creator program, which launched as a Fortnite promotion in October. 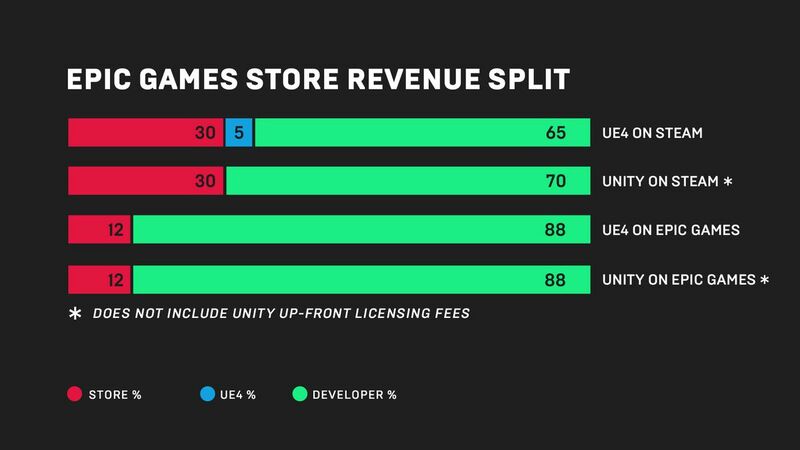 When the Epic Games Store was announced Dec. 4, it was also mentioned as a component of the store, but not much else was said. On the podcast, Galyonkin made it clear that Epic sees Support-a-Creator as doing two things: 1) driving the customer population as a whole toward games for sale, more than any landing page or user reviews. And 2) that Support-a-Creator is what Epic needs because it sees the Games Store’s customers as younger than Steam’s — perhaps not even using Steam. In a translation discussed last week on Resetera, Galyonkin notes that only half of all Fortnite players have Steam installed and of them, 60 percent aren’t using it actively. (Galyonkin later disputed this translation, though he confirmed this and other details of it on Twitter and elsewhere.) What this means is that when independent developers were sending out Steam keys to promote their games, a goodly number of them had no idea what they were for and asked the developers what they should do with them. What that means, Galyonkin reasoned, is that most of the discovery of games listed on Epic Games Store will take place outside of the store. That’s where influencers come in. And while Epic Games says it will help out by fronting (for a limited time) the 5 percent that say, a streamer gets when someone buys a game off a referral link, it fairly raises new questions for whether and how a smaller developer’s game gets a fair shake, as much as user reviews do on Steam. Consumers might wonder if a stream or a let’s-play of an Epic Games Store game, with a referral link on the video’s page, is trying to encourage sales more than present the game for informative or entertainment purposes. Galyonkin, on the podcast, said that Epic won’t give developers and publishers the means of contacting Support-a-Creator influencers through the store itself, beyond simply sending out a code and any supporting assets (like an online guide). But then game makers and sellers would be somewhat in the same boat they are with user reviews on Steam — where they’re at the mercy of a user whose opinions may be mistaken or uninformed, that they can do little to address, except their game is getting trashed by someone ostensibly being paid to promote it. Galyonkin earlier said on Twitter that the Epic Games Store would, at some point, introduce user reviews as a feature, but not until the company works out ways to defeat the obnoxious “review bombing” that happens on Steam when large groups of gamers get in a snit over something unrelated to the product’s quality. Developers could choose to permit user reviews on their games or opt out altogether. They can also revise the influencer payout up or down as they please, or not participate at all. Remarkably, Galyonkin speculated that smaller developers might choose to pay a higher percentage — like 20 percent — because of their comparatively smaller sales. But in already giving up 12 percent to Epic (a very favorable split, to be sure) a 20 percent commission for an affiliate link gets them less than the 70 percent they would make selling through Steam. The Epic Games Store is still less than two months old and slowly rolling out more features, as well as more games. The company surely isn’t giving up all of its intentions right here, either. But it does bring into focus how Epic is leveraging a once-in-a-generation hit in Fortnite, through the access it brings to a younger and different market, and the streaming culture that game has done so much to build. This bears watching.